A motley alliance of socialists, liberals and conservatives won the 9 December Romanian parliamentary elections. What they clearly share is profound dislike for the country's once-powerful president, Traian Basescu, whose five-year mandate continues into 2014. What is less obvious is how they will govern the country. Romania's most wanted man? 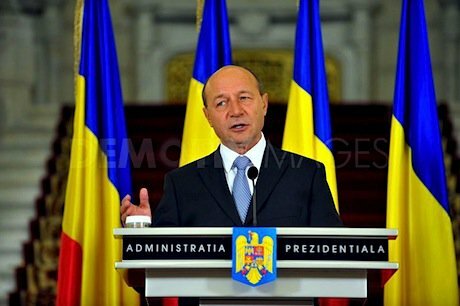 President Traian Basescu. Demotix/georgecalin. All rights reserved. The Socialist-Liberal Union (USL), made up of the Social-Democrats, the Liberals and the Conservatives, won the majority in both chambers of the Romanian parliament, with about 60 percent of votes for each house. The great loser was the Right Romania Alliance (ARD), president Basescu's political family, which got just 16 percent. The main party in ARD, the Liberal-Democrats, governed Romania until May this year, implementing one of the toughest austerity packages seen in Europe, following a loan of twenty billion euro contracted by Romania in 2009 from the International Monetary Fund (IMF) and European Union (EU). Among other measures, Romanian state employees saw their salaries slashed by 25 percent, social benefits were cut, and the VAT was increased from 19 to 24 percent. At the time of contracting the loan, president Basescu called it "preventive" as Romania's deficit and debt were to be kept from spiraling out of control – even if the budget deficit was just below eight percent and the debt a third of GDP in 2009, not particularly high figures compared to other EU countries. That goal was achieved, and Romania is expected to have a (minute) one percent economic growth next year. But the measures took a serious social toll. Thousands of doctors left the country over the past years in search of better pay, subsidies for medicines treating serious diseases have been cut to morbid consequences, maternal assistants have abandoned children in their care, and people with disabilities have seen their allowances diminished. Numerous small businesses went bankrupt. Against this backdrop, January 2012 saw the most important popular mobilisation in Romania since the anti-communist protests of the early 1990s. Pensioners, mothers, students, workers took to the streets for weeks in a row in the freezing weather in Bucharest and other cities across the country. People rejected austerity and criticised the entire political class for failing them. In a country of traditionally low street mobilisation, the January movement was exceptional. Two subsequent Liberal-Democrat governments collapsed in 2012. In the spring, after an important faction of Liberal-Democrat parliamentarians switched sides to join other parties, the main opposition force, an alliance of Social-Democrats and Liberals, had enough support to appoint a prime minister, Socialist Victor Ponta. Ponta’s mandate did little to address the concerns of the Romanian people. On the contrary, the new prime minister (together with his ally, Liberal Crin Antonescu, who became head of the Senate) focused on getting rid of their biggest political enemy, president Traian Basescu. An attempt to impeach the president was rejected in a popular referendum in July because of low participation at the polls (while the majority of those showing up did vote for impeachment). While Basescu was able to pose as a victim following these dubious political maneuvers, one of the main reasons for which his popularity plummeted – in addition to him being the main advocate of austerity – has been his own behaviour as a president, bordering on anti-constitutionality. While in Romania a president is supposed to stay neutral and act as an arbiter among political forces, Basescu was a strong promoter of the Liberal-Democrats. In addition, he visibly directed the economic governance of the country, a function that does not fit in his official mandate. In the midst of the political bickering, the actual governing of the country was put on hold. Romania, which entered the European Union in 2007, is hardly able to take advantage of the European funds put at the disposal of the poorest members. While EU regional funds for the less well off are reportedly one of the reasons Poland has fared relatively well through the economic crisis, Romania had an absorption rate of below ten percent for these funds in 2012, which José Manuel Barroso, President of the European Commission, called “painfully low”. In order to benefit from European funds, citizens and institutions must have the know-how to conceive projects and the ability to co-finance and implement them; this capacity is still lacking in Romania. This year, Romania could definitively lose between 200-300 million euros of EU funds. Meanwhile, last year, Romania borrowed an additional five billion euro from the IMF, an agreement that is expected to be prolonged in 2013. Among the conditions for receiving this money, Romania is expected to privatise – partially or fully – the country’s main companies: Romgaz (the main gas producer), Transgas (the main gas distributor), CFR Marfa (the freight rail company), Tarom (the national airlines), Oltchim (the main chemical company), Nuclearelectrica (an electricity producer), and others. The government has been advancing slowly with the sale of the companies’ shares, but certainly not because of stopping to publicly debate the advisability of these privatisations. Socialist Ponta, whose party is the main force in the USL alliance which just won the elections, was appointed as the new prime minister on 17 December (hence, keeping his current post). Yet Ponta’s steps to date as prime minister as well as the 2013 budget announced by the government on 14 December give little signs of more than business as usual. Promises to introduce bigger taxes for the rich have been put on the back burner, and funds initially attributed for investment in the economy will be used to finance a marginal increase in salaries, to bring them back to their pre-cuts levels (the raise was already started during 2012, planned by the Liberal-Democrats). Worrying are also the questionable stability and reliability of USL. Bringing together political forces that are nominally socialist, liberal and conservative – albeit, as elsewhere in Europe, there are hardly any clear ideological distinctions between the main political forces in Romania anymore – and made up of politicians that have often switched sides following the winners of the day, USL is unlikely to last for a full mandate. Nor do Romanians have many alternatives. The Liberal-Democrats are fiercely hated because of their austerity measures. And hardly any independents made it into the parliament. The few fresh faces that ran in the recent elections have been systematically sidelined by a mainstream media sold to either side of the main political battle. In one of the Bucharest districts, 34 year old IT engineer Iulian Craciun, suffering from spinal muscular distrophy, ran a courageous independent campaign but lost to the leader of the Conservatives, Dan Voiculescu, a former Securitate informer and owner of one of the country’s biggest media trusts. Regardless of what Brussels has been saying this year, the real threat to Romania’s democracy is not that Ponta’s government temporarily diminished the powers of the constitutional court, albeit that is important too. The real democratic crisis is that Romanian electors cannot find independent, fresh thinkers among their candidates - and that they have no control over momentous decisions about the country’s socio-economic situation being taken right now, but covered up by the noise of the political infighting.